Lexington, Ky. – US Equestrian and Equestrian Sport Productions (ESP) are pleased to announce their partnership designating the USEF Network as the exclusive live streaming platform for ESP events for the remainder of the 2019 season at the Palm Beach International Equestrian Center and the Adequan® Global Dressage Festival (AGDF). Events streamed on the USEF Network will be free to watch for US Equestrian competing and fan members. Free fan member sign-up and promotional codes will be available each week, beginning with the $25,000 ProElite® National Jumper Classic on Thursday, February 28, using code 2019WEF8. To sign up for a free fan membership, please visit here. Visit the USEF Network for a full list of live, upcoming, and on-demand content. Emanuel Andrade and Wilco. Photos copyright Mancini Photos. Wellington, FL – November 3, 2014 – Equestrian Sport Productions (ESP), management company of the world-renowned Winter Equestrian Festival (WEF), hosted its Fall Finale Horse Show this weekend on October 31 – November 2, 2014, at the Palm Beach International Equestrian Center (PBIEC) in Wellington, FL. 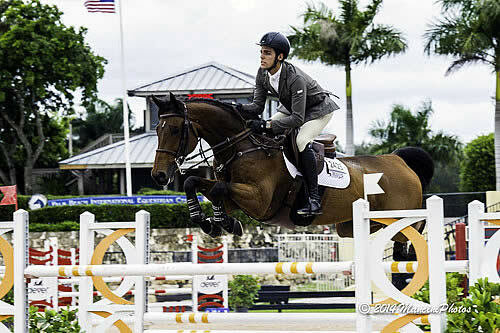 The show hosted its $25,000 ESP Fall Finale Grand Prix on Sunday with a win for Venezuela’s Emanuel Andrade and Wilco, Andrade also finishing second aboard Nokia de Brekka. 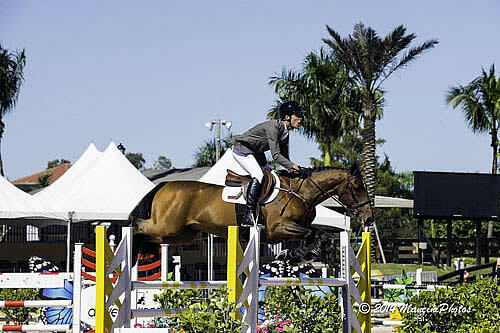 Thirty entries contested the first round course set by Hector Loyola, where 13 went clear to advance to the jump-off. Seven combinations jumped double clear over the short course, and Andrade completed the two fastest clear rounds. He and Wilco stopped the clock in 42.74 seconds for the win. With Nokia de Brekka, a brand new horse that he has only been showing for two weeks, Andrade took the second place prize in 44.59 seconds. Tom Foley and Sweet Oak Farm’s Petrushka III placed third in 44.79 seconds, and Catherine Pasmore and Pasmore Stables LLC’s Z Canta were fourth in 45.02 seconds. Andrade represented Venezuela in the Alltech FEI World Equestrian Games in France this summer and spent some time showing in Europe before returning to the states. He was excited to do so well with his horses on Sunday. He jumped first with Nokia de Brekka and then improved on that time with Wilco. The winning 11-year-old KWPN gelding (Nabab de Reve x Fedor) is usually Andrade’s 1.60m horse and the rider was surprised at how fast he went. In addition to his grand prix victory, Andrade also won the $10,000 Open Welcome Stake earlier in the week, repeating his victories from the Fall II and Fall III Welcome Stakes. This time the win came with Nokia de Brekka, a 13-year-old Selle Francais gelding (Quick Star SF x Apache d’Adriers). Nine out of 19 entries jumped clear to advance to the jump-off where the pair had the fastest double clear round for the win. The 2014 ESP Fall Circuit will continue with two more weeks of competition featuring $10,000 Welcome Stakes on Sunday, November 9, and Sunday November 16. The ESP November “Regional” and Jumper 3 horse show runs November 8-9 and counts for both PBCHA & ESP Circuits. The ESP “Regional” Pre-Charity and Jumper 3 competition runs November 15-16. To view the prize list and for more information, please visit www.equestriansport.com. Debbie Stephens and FYI. Photos copyright Mancini Photos. Wellington, FL – October 27, 2014 – Equestrian Sport Productions (ESP), management company of the world-renowned Winter Equestrian Festival (WEF), hosted its Fall I, Fall II, and Fall III horse shows in October at the beautiful Palm Beach International Equestrian Center (PBIEC) in Wellington, FL. The Fall III horse show hosted national “AA” hunter and 3-star rated jumper competition this week on October 24-26, 2014, featuring PBIEC’s first grand prix of the fall season on Sunday. Jumping a course set by Archer “Skip” Bailey, Debbie Stephens of Palmetto, FL guided Centennial Farm’s FYI to the win in the $25,000 Fall III Grand Prix. Twenty-four entries started in round one and just three combinations were able to jump clear to advance to the jump-off, where Stephens and FYI completed the only double clear round in 46.22 seconds for the win. Michael Morrissey and Starbit Partners LLC’s Padie Blue Cardu had four faults over the short course in 44.99 seconds to place second. Cara Cheska and Windswept Farm’s Imprimis finished third with eight faults in the jump-off in 45.41 seconds. A tight time allowed kept a few others with clear jumping efforts out of the second round. Stephens has owned FYI, an 11-year-old Oldenburg gelding (VIP x Zeus), since the horse was four years old. After showing him a little when he was younger and then leasing him out for a few years, she decided to finally see what the horse could do at the grand prix level. Stephens praised Sunday’s course for being set at a high standard and acknowledged the team at Equestrian Sport Productions for keeping all of their shows at PBIEC up to that level. “I have to commend them because they really have a high standard, whether it be at the fall series or during the winter at WEF. When you go there and you ride in the International Ring, no matter what you are going for, they always keep that standard up,” she commented. Stephens plans to show FYI again next week and will then compete in a grand prix in Venice, FL the following week. The horse will then come back to compete this winter at the Winter Equestrian Festival. A $10,000 Open Jumper Stake Class was held on Friday, October 24, during the Fall III competition with a win for Emanuel Andrade aboard his horse Bon Jovi. The class saw 24 entries with seven clear rounds to advance to the jump-off where Andrade and Bon Jovi jumped the fastest of seven double clear rounds in 36.42 seconds. Michael Morrissey and Rae Marie Kennedy’s Torino Q finished second in 38.60 seconds. Luis Larrazabal and San Francisco Stables LLC’s G&C Up Close placed third in 40.40 seconds. Andrade also took top honors in the $7,000 Open Jumper Stake during the Fall II competition one week prior. In that class, Andrade finished first and second with double clear rounds in a three-horse jump-off. He won with Maria Alejandra Andrade’s Tinkerbell S.C.H.Z. and placed second aboard Ecurie Michel Hecart’s Nokia de Brekka. In the $10,000 Fall I Open Jumper Stake, Victoria Karam and Elena Couttenye’s Good Boy HM were the winners with the only clear round out of 22 entries. Claudia Billups and Platini VDL and German Cathargo and Centurio each finished with two time faults. Billups was slightly faster to take the second place prize and Cathargo placed third. The five-week ESP fall circuit began October 10 and continues through November 16 featuring top hunter/jumper competition at PBIEC. The series will host its second grand prix competition coming up during the Fall Finale Horse Show. The $25,000 Fall Finale Grand Prix will be featured on Sunday, November 2. The horse shows of the 2014 ESP Fall Circuit are all United States Equestrian Federation (USEF), North American League (NAL), and Marshall & Sterling League (M&S) approved. A $10,000 Open Jumper Stake class will be held at all shows as well as $500 Pony and Hunter Classics. All shows will also highlight great competition for child, junior and amateur jumpers, including Classics. Frances Land and Vieanne. Photo © ManciniPhotos. Wellington, FL – January 6, 2014 – Equestrian Sport Productions (ESP) hosted its Holiday Finale horse show on January 1-5 at the Palm Beach International Equestrian Center (PBIEC) in Wellington, FL, with a full schedule of great competition. The show hosted a $10,000 Open Jumper Stake as well as the $25,000 Holiday Finale Grand Prix, featured under the lights on Saturday night. Anthony D’Ambrosio, of Red Hook, NY, was the course designer in the International Arena at PBIEC this week. He set the track for 44 entries in Saturday night’s $25,000 Holiday Finale Grand Prix for an exciting win for Frances Land (USA) aboard the 12-year-old Dutch Warmblood mare Vieanne (Andiamo x Voltaire). The pair had the fastest of three double clear rounds in the jump-off in 39.556 seconds. They beat out Shane Sweetnam (IRL) and Mimosa, owned by Sweek Oak and Spy Coast Farms in their time of 41.195 seconds. Gabriela Mershad (USA) and Mershad Stables LLC’s Skara Glen’s Basel also cleared the short course and finished third with their time of 43.162 seconds. Roberto Teran (COL) and ARK Partners LLC’s Tam Tam Hero had the fastest round of the night in 39.521 seconds, but had one rail down to finish fourth. The pair had an amazing 2013 season with wins in the $33,000 Pepsi Challenge 1.45m at Spruce Meadows this summer, the $50,000 Show Jumping Hall of Fame Series Championship Grand Prix in Kentucky in October, and the $45,000 EMO Grand Prix in Georgia as well as the $33,000 G&C Farm 1.45m Classic at ESP’s Holiday and Horses competition in November. Land noted that Vieanne really enjoyed showing under the lights at PBIEC this weekend and thrived off of the crowd cheering her on. Land is currently in school at Emory University and rides on the weekends at her family’s farm in Georgia. She plans to return to Wellington during week two of the FTI Consulting Winter Equestrian Festival, which runs January 15-19. ESP’s Holiday Finale hosted a $10,000 Open Jumper Stake class on Thursday afternoon with a win for Danielle Goldstein and Israeli Equestrian Partners’ Carisma. Thirty-one entries showed with 14 clear rounds to advance to the jump-off. Just five of those were able to jump double clear, and Goldstein had the fastest round of 37.618 seconds for the win. Lorenzo De Luca and Neil Jones Equestrian’s Utopias finished second in 38.172 seconds. Lauren Tisbo was third and fourth, stopping the clock in 38.573 seconds aboard Roundthorn Madios and 39.131 seconds with Darcon Scheefkasteel Z, both horses owned by Tequestrian Farms LLC. The $1,500 Tackeria NAL Child/Adult Jumper Classic was held on Friday with a win for Jacklynn Carey and Sher-Al Farm’s Lexa 22. Stephanie Ann Cook and Lionsway Farm’s Eastbound and Down finished second with Shanee Herskovitz and Divo in third. Friday also featured a $1,500 Low Children’s Jumper Classic, with a win for Anderson F. Wagner aboard Thunderball. Carly Dvorkin and Joe Saltim Z placed second, and Charles Jacobs Jr. was third aboard CMJ Sporthorse LLC’s Elphaba. In the $1,500 Low Adult Jumper Classic, Christina Cohan was the winner aboard Susan Dixon’s Shamrock. Elizabeth Craven and Silverado finished second, and Jim Buchanan guided Ariane Stiegler’s Watkiekie to third place honors. Saturday’s $1,500 M&S Children’s Jumper Classic saw a win for Alexandra Indeglia riding Hans, with Hana Bieling and Wonderland Farm LLC’s Rainbow Brite in second. Baily Martin and Contador finished third. In the $1,500 M&S Adult Jumper Classic, Jacklynn Carey and Lexa 22 earned another victory. Annie Gardner and Cassandra Z finished second, and Tracey Logan was third aboard Curb Appeal. The $2,500 Equiline NAL Low Junior/Amateur-Owner Jumper Classic was also held on Saturday, with a win for Stephanie Novas aboard Aretina M. Allyson Shryoc placed second aboard Cheval d’Espoir Z, and Stephanie Novas was also third riding Amyra R. Erin Haas and North Face Farm’s As Di Chupito were victorious in the $2,500 High Junior/Amateur-Owner Jumper Classic, sponsored by Gold Coast Feed. Gabriella Mershad and Mershad Stables LLC’s Udonna placed second. Adrienne Sternlicht and Hathaway were third. A full schedule of hunter and equitation classes was also held throughout the week. In the Amateur-Owner Hunter 18-35 division, Krista Weisman and Reality earned the championship with Bella Cramer and Emilio in reserve. The #1 Education Place Junior Hunter 3’3″ champion was Redfield Farm’s Playlist, ridden by Eliza Bienstock with Rockin La Bamba and Audrey Muscari in reserve. The #1 Education place Large Junior Hunter champion was Amanda Foard’s Julian, ridden by Ashton Alexander. Further Lane Farm LLC’s Stellar and Sophie Michaels finished in reserve. Ali Tritschler topped the #1 Education Place Small Junior Hunter division, earning the championship aboard Isabelle Mann’s Einstein and finishing in reserve aboard Elizabeth D’Loren’s Zapateada. In the combined Performance Working Hunter 3’3″ and 3’6″ division, championship honors were awarded to Deborah Perkins’ Set To Music, ridden by Havens Schatt. There was a tie for reserve honors between Jane Olson Fisher’s Stoli with Stephen Heinecke in the irons as well as Lordano and owner/rider Lynn Seithel. Kelley Farmer earned the Regular Conformation Hunter championship with Glefke and Kensel LLC’s Scripted with Zenfield Farm’s Garcia and Adam Ottomanelli in reserve. Ottomanelli and David Glefke’s Pen Name also tied with Zenfield Farm’s Next Page and Evan Colucci for championship honors in the Second Year/High Performance Working Hunters. Kelley Farmer and Glefke and Kensel LLC’s High Regard were reserve champions. Mary Katherine Shaugnessy won the Pilates Rocks Low Adult Hunter championship riding Special K, owned by Shaughnessy’s Shamrock Ventures LLC. June Speisman’s Magic Hour and Jennifer Speisman finished in reserve. Shaugnessy was also reserve champion in the Low Working Hunters aboard Shaugnessy’s Shamrock Ventures LLC’s Whitecap with Michael Delfiandra and Karen Brook’s Arjuno topping the division. In the equitation classes, Ashton Alexander and Donald Stewart’s Fernleigh won the Pessoa/USEF Hunter Seat Medal presented by Randolph College as well as the Platinum Performance/USEF Show Jumping Talent Search. Ali Tritschler won the ASCPA Maclay class aboard Lauren Wessan’s Krunch, and Ailish Cunniffe won the WIHS Equitation Overall riding Venice. For full results, please visit www.showgroundslive.com. The 2014 FTI Consulting Winter Equestrian Festival begins this Wednesday, January 8, and runs through March 30, 2014. The Mar-a-Lago Club is the title sponsor of week one competition as well as the presenting sponsor of the $30,000 Mar-a-Lago Club Grand Prix, which will be held on Sunday, January 12, at the Palm Beach International Equestrian Center. Another highlight of the week is the $75,000 Nespresso Battle of the Sexes, which starts the “Saturday Night Lights” series on Saturday, January 11, with gates opening at 6 p.m. For more information, please visit www.equestriansport.com. Wellington, FL – November 5, 2013 – After nearly 18 months of legal battles and turmoil in Wellington and in the equestrian industry, Equestrian Sport Productions is pleased to announce that it has conditionally accepted the Equestrian Village Resolutions approved by the Wellington Village Council on October 22, 2013. The only conditions to the acceptance are slight modifications to the language of two conditions to reflect the language clarified and voted on by the Council at the meeting. The Master Plan Amendment approves the additional ingress and egress access off Pierson Road, allowing for access to the Equestrian Village by exhibitors, horse trailers and others. The Compatibility Determination grants approval for the site to operate as a permanent Commercial Equestrian Arena, with year-round uses of the facilities approved by the Council in a conceptual site plan that lays out in detail what the proposed configuration and uses of the property will be. ESP’s acceptance of the Resolutions is one of the final steps in the settlement agreement with the Village. Barring any unforeseen circumstances, the litigation between ESP and the Village will be dismissed and the legal battles will be over. The end result is one that is a benefit to the Wellington community and allows the parties to move forward with a positive and fruitful working relationship. The 2014 Global Dressage Festival will operate at the Equestrian Village property under a Special Use Permit as the permanent improvements approved through the new Resolutions phase in. ESP is looking forward to providing the best dressage venue in the world.